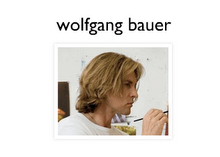 ONE Archives Gallery & Museum is honored to present the latest series of large, rich, and loaded oil paintings by Austrian artist, WOLFGANG BAUER. "Queer Theories" is a politically charged and bold body of work that captures the heart and provokes the mind. A reflective and emotionally challenging journey into the unresolved. The concept for my latest series of paintings evolved from interdisciplinary studies of sociology, philosophy and from autobiographical episodes of oppression. This work touches on problematic issues like the politics of gender within patriarchal family structures and interrelated issues of childhood development. By painting the protagonists life sized, making direct eye contact with the viewer, I attempt to elicit a discourse between the viewer and the predicaments’ of the painted characters. The viewers’ own social, cultural, political and religious backgrounds are the determining variables of how one interprets the depicted situations. By keeping the depicted situations purposely open-ended and unresolved, no specific discriminating values or judgments are assumed. Instead, the depicted situations cue the viewer to examine his or her own prejudices. As you take a moment and engage in the paintings, you might ask yourself if the characters remind you of someone or something in your own personal life. Perhaps, you even see elements of yourself?